Happy Hammock Eco Beach is wonderfully located at the famous Praia Vermelha on a peninsula with no road access. 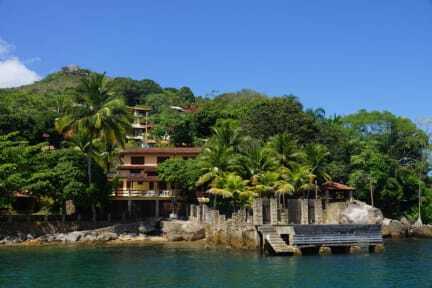 The beach can be reached with a nice 20 minutes boat ride from Paraty harbor (no access by road, only boat). Surrounded by a beautiful green rainforrest the guests can enjoy the fun and familiar atmosphere, spend their time in the hammocks and can free their mind. Breathtaking views, biolumniscent plancton, fireflies, stars, sun- and moon-rise invite guests to relax and feel and enjoy the nature. Daily changing, healthy menus, a lovely Pizza place and a bar provide sustenance for the guests. Breakfast is served every morning. Most rooms offer stunning sea views and private bathrooms. As we are an ecological place, we care about the conservation of water and other natural resources in the surroundings. Boat trips and other excursions can be done in Paraty. We are happy to assist you in the planning and booking. IMPORTANT INFORMATION: We are only reachable by boat! There is no road access to our place and it is not possible to walk into town in the evening! Please note that we require an additional 20% deposit for bookings during carneval seasons, payable via PayPal. In brazilian portuguese, there's no word better to describe this place than "TOPZERA". 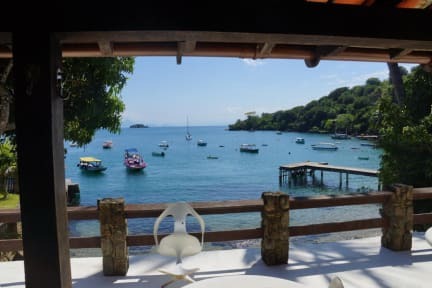 Beautiful view, large and confortable rooms, delicious dinner, great reception made by the host and the chance to enjoy Paraty far away from the crowd (even in holidays). The hostel upgraded recently and offers electricity all day long. If you are searching for tranquilty by the sea and nature, that's the place. Worth it! I have no words to describe, It’s all about feeling . The best place ever, stunning beaches, delicious caipirinhas, peace... Can’t find problems in such a beautiful place, also I enjoyed some drinking so everything is just amazing. I’ve been there 2 times and will keep going. I had a wonderful experience in this place. It was clean, dinner was delicious and the breakfast been served in the balcony with an unforgettable view. Patrick was hospitable. I'll come back soon. Um lugar maravilhoso, para relaxar. O lugar é fantástico! Ótimo pra relaxar, conhecer pessoas novas e praias desertas incríveis! E o jantar é uma delícia, como se fosse uma grande celebração. Super recomendo!!! Passei um ótimo feriado em setembro. Patrick é muito atencioso e me ajudou em tudo que precisei. Ficamos sem água quente no segundo dia de estadia. No entanto o lugar é excelente. Agua transparente na frente da pousada. Coisa de filme. O Patrick é uma excelente pessoa, mas poderia ser um pouco mais anfitrião Ele perde a oportunidade de vender as bebidas que tinha disponível, por não oferecer. Talvez seja uma coisa mais de hotel isso, mas as pessoas consumiriam mais se ele lembrasse a elas as opções disponíveis. Certamente eu voltaria ao hostel.